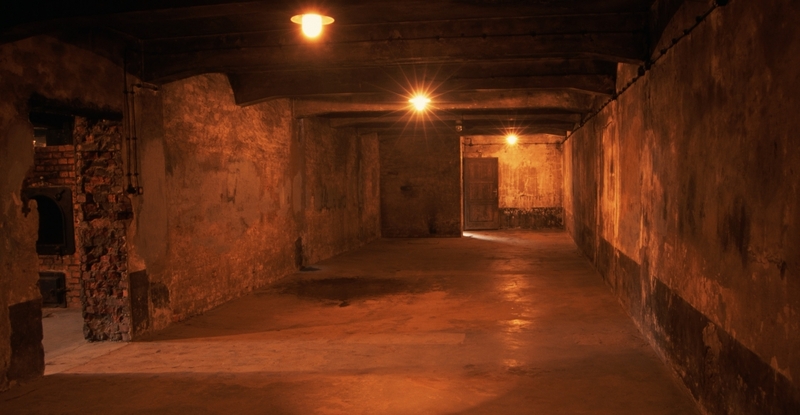 This is a gas chamber in Auschwitz where gas tablets were dropped through the ceiling exterminating up to 6,000 Jewish souls each day. This was the largest work camp of the Third Reich and located in Poland. The Germans built the majority of the Death Camps outside of Germany to hide them from the German people. The sign over the gate says, Work Shall Set You Free. This is a BBC produced and filmed production. It has no car chases or explosions. It is thoughtfully written and acted script set an London courtroom. The shots of the visitation to Auschwitz are black and white and viewed through the fog. It is especially topical now with so many people on Face Book “denying” the existence of the Holocaust. This bent of rewriting history is” raising its evil head “all over the world. Why is that so ? Because of lack of exposure of history in the schools? Denial? Following the crowd? Here is a video of a survivor of Auschwitz where I have not visited. We did go to Dachau near Munich. It was the first concentration camp established by the Nazis. Jewish people were used to work in the work camp and also subjected to medical experimentation. It was not officially a “Death Camp” but many Jewish people lost their lives figuratively and literally even if there were not gas chambers. For me, being in Dachau, and at the Slave Trade Forts in Ghana, and walking Normandy beaches all three where death, pain, suffering beyond belief permeated the air. Dachau had the same welcoming, ironic sign over the gate. . . Work Will Set You Free” as did Auschwitz. As we walked into the grounds, there was a large stone table with groups of rocks piled on the top. We learned it is a Jewish tradition to live rocks when visiting a the grave of a loved one. David and I both wept as we left rocks above the engraved table. This entry was posted in Architecture, Religions of the World, Travel, Uncategorized and tagged "The Denial" a film, Auschwitz, Dachau, Death Camps, Germany, Holocaust Denials, How to prove the historicity of the holocaust., movie, Poland, The Holocaust. Bookmark the permalink. I have visited Bergen-Belsen camp back in the 50s and the numbers of victims written on the plaques of the burial mounds were horrendous. After seeing the British army films of the state of the camp at liberation time there are no words to describe these loathsome acts. I think that camp is near Prague.It is an experience forever seared into ones heart and brain. The Germans kept impeccable and complete records so they were dammed by their own efficiency! I remember the huge maps covering the walls showing all the camps all over Europe. Everybody must have known something horrendous was going on, if not the details which most people could not even imagine. Not sure where you live but I would really recommend a visit to the Holocaust Museum in Washington DC.